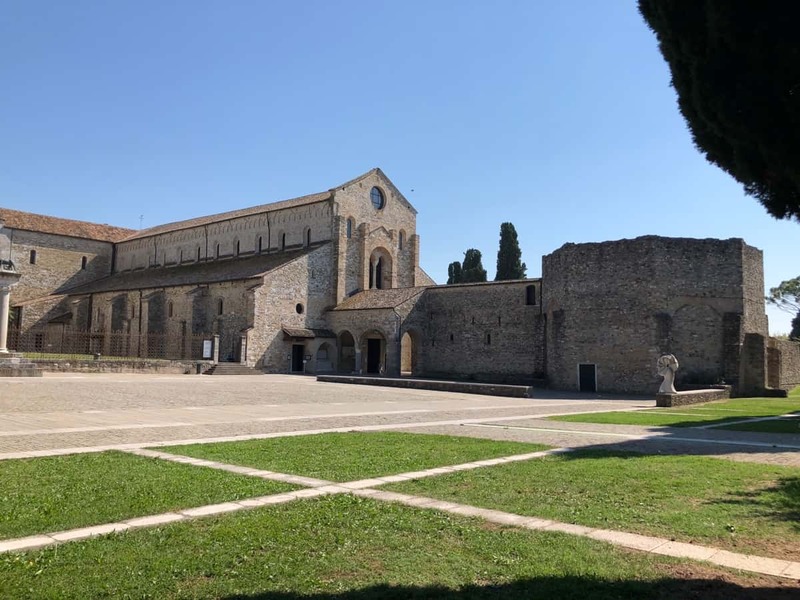 Home » Italy 🇮🇹 » Grado and Aquileia, Italy. 2018. 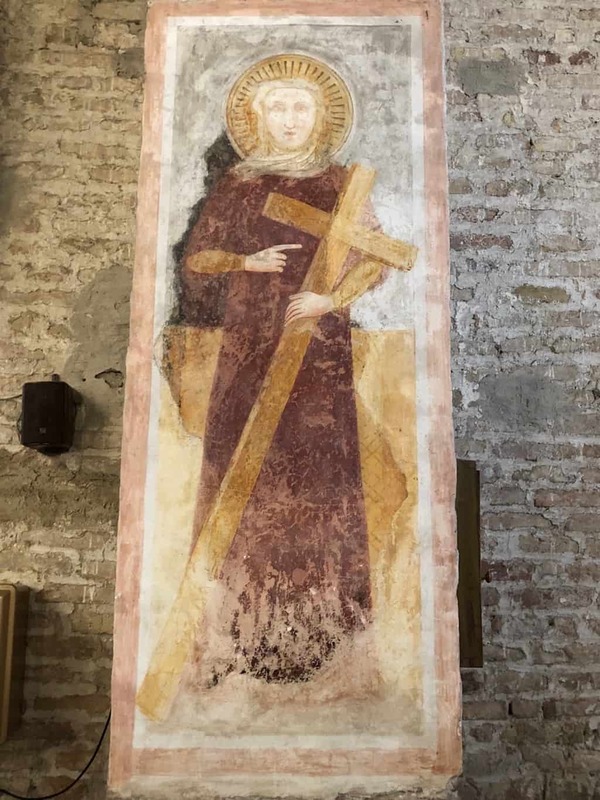 Grado and Aquileia, Italy. 2018. 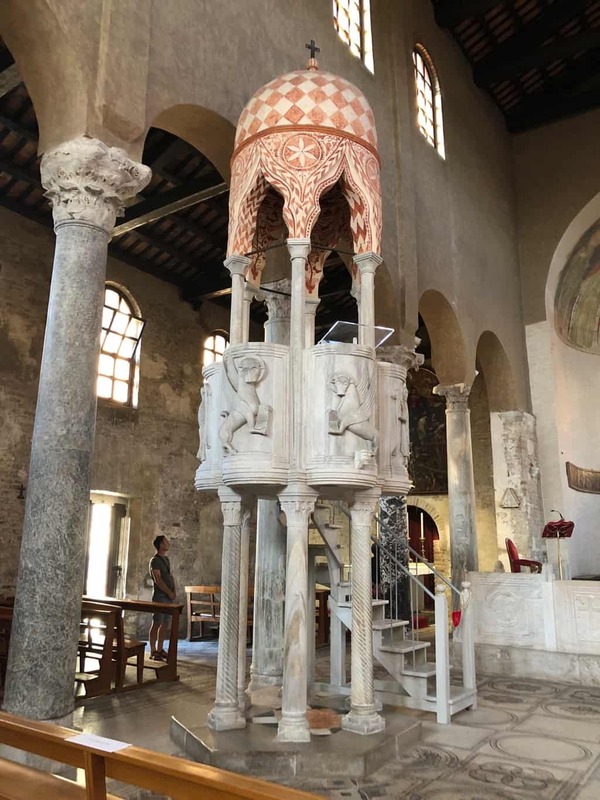 Travelled: 130 kms from Venice in Veneto to Grado in Friuli Venezia Giulia, Italy. Budget: 108 days @ €93 per day. Our visit to Venice complete, last night we discussed a chill out day to relax a little. 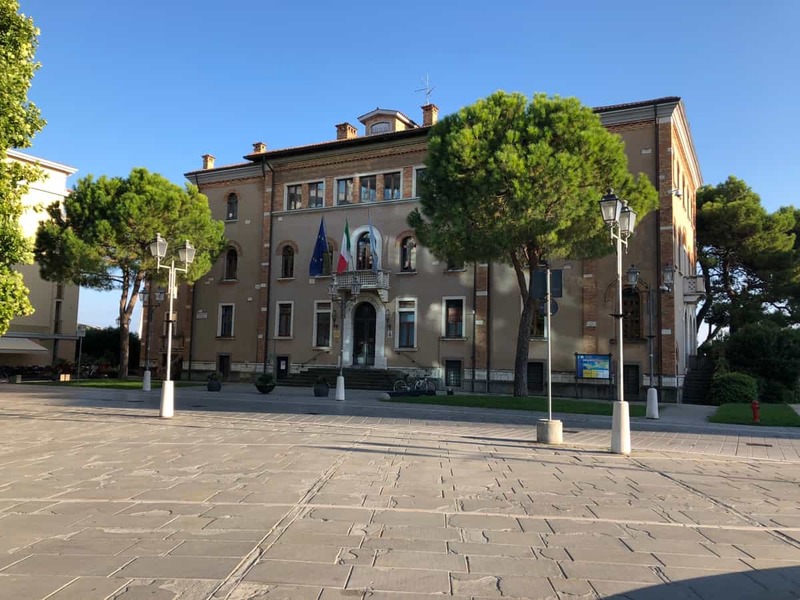 So we set our sights on the sea-side town of Grado in the provence of Friuli Venezia Giulia, about a 100 klms east of Venice. I know your thinking, Friuli Venezia Giulia, who would give that name to a provence ? Doesn’t roll off the tongue like New South Wales does it. After coffee and fruit we service the Hymer, Pam pays the proprietor and we make our way into the morning traffic again. We find ourselves on the A4-E10 for about 80 kms. 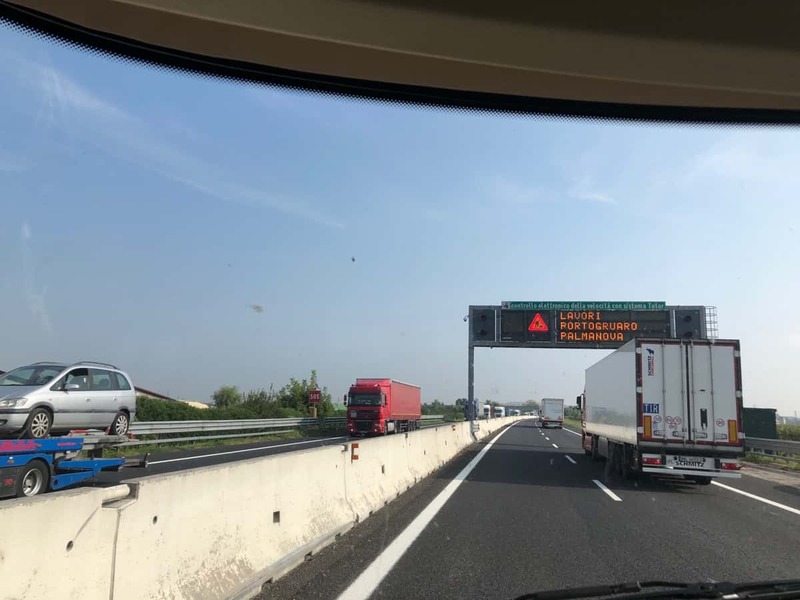 This is apparently the motorway between Italy and Slovenia as well as connections to Hungary, Croatia and Serbia etc. The photo doesn’t do it justice, literaly hundred of trucks nose to tail at 90 kph in both directions. 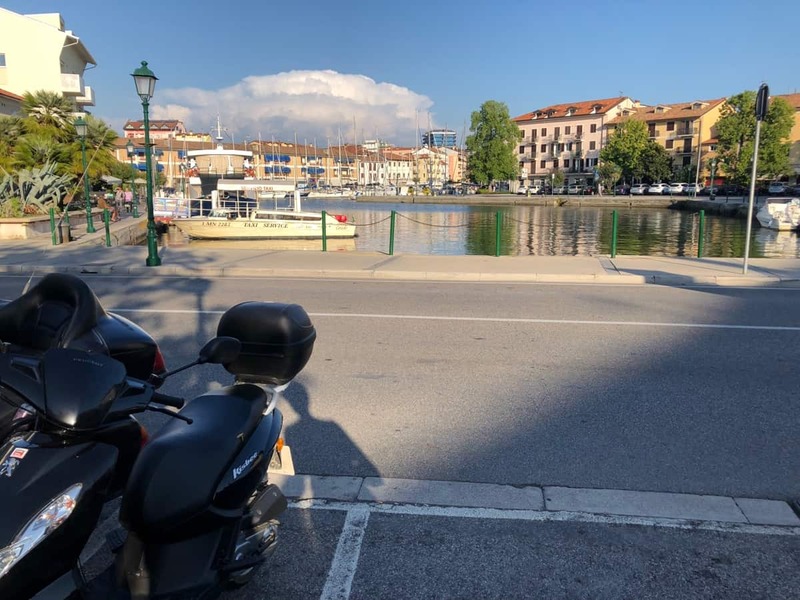 Having stopped at the Lidl for a re-stock as we pass through Cervignano del Friuli, we then continue on to Grado and way up our overnight options. There is a formal sosta with boom gates and all the services for €16 with 5-6 motorhomes in situ. Across the road but closer to the beach a large car-park with no services at €4 with 20-25 motorhomes, all Austrian or German lined up on either side. A little detective work reveals you can use the sosta service if you have a €4 parking ticket. The decision is an easy one. We settle in, roll the scooter off and wizz up to the beach. 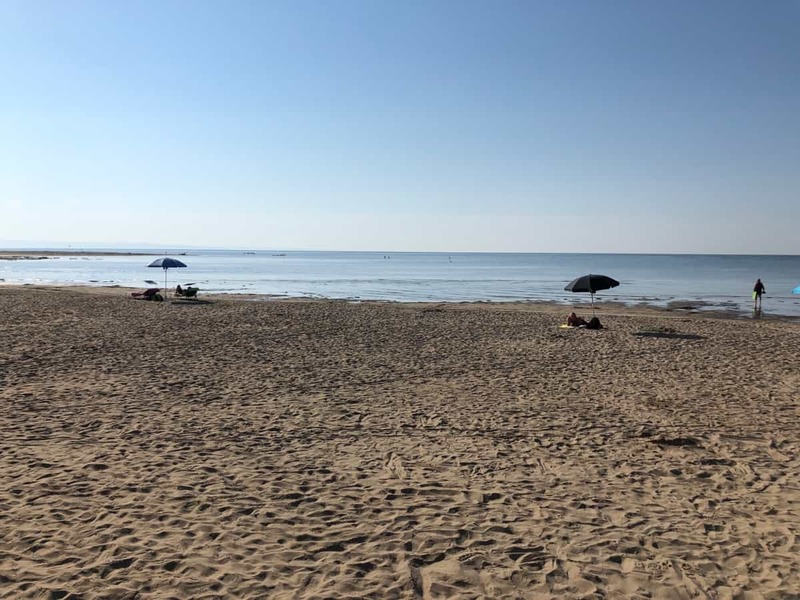 I can tell you are impressed by the beach at Grado. After two days of walking around Venice it looked alright. 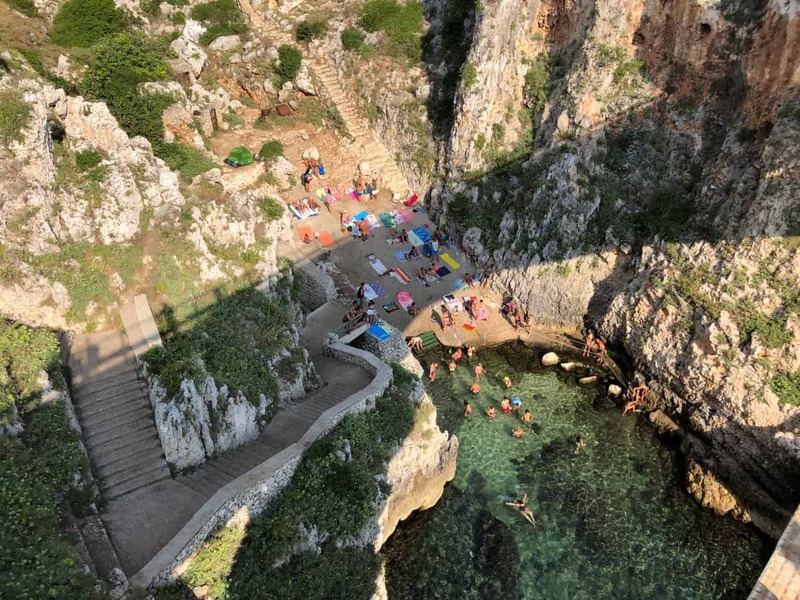 The sand is relatively clean, the water was reasonably clear. You not likely to catch a wave because there isn’t any and getting wet takes some leg-work, some 500m out and it’s waist deep. 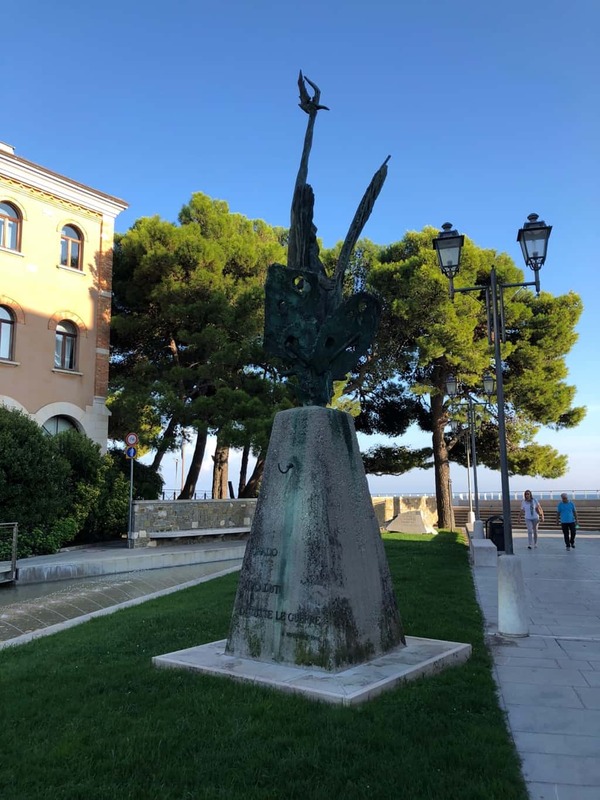 After a swim and relax for a couple of hours we head into Grado Centro for some exploring and a drink. Standing on one side of the Gulf of Trieste, it seems a yatchies haven. The town hall marks the start of the old town, which is really the church, some lovely old houses and some roman era ruins. 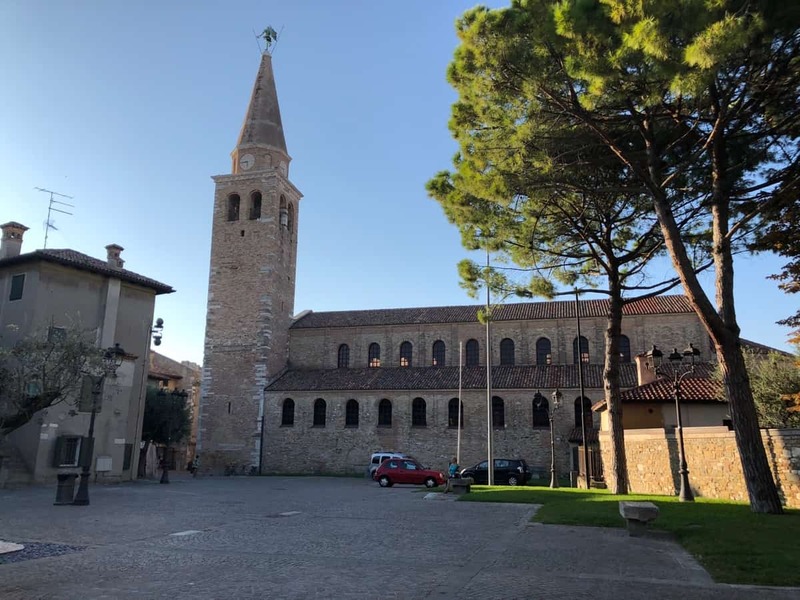 The Romanesque Basilica di Sant’Eufemia, circa 15th century marks the centro of the old town. It is something to behold inside. 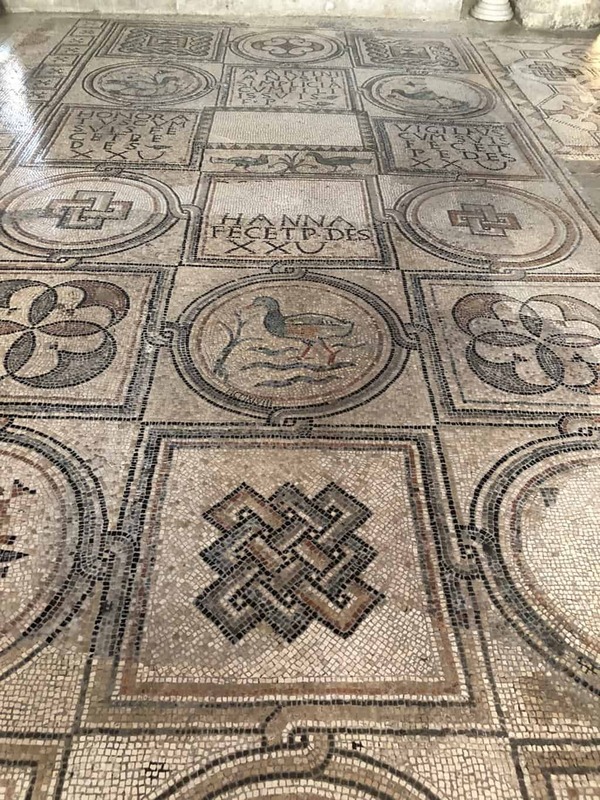 The mosaic floor dates back to an early church that stood on the site. 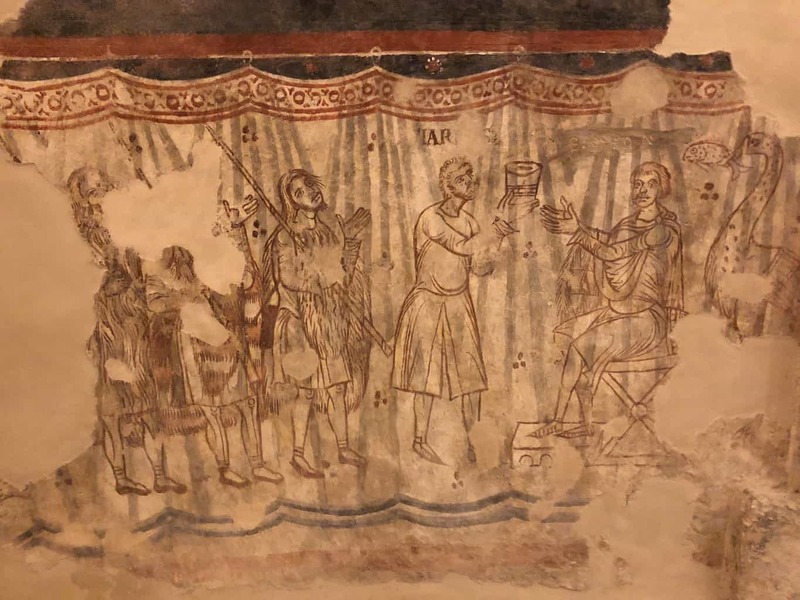 We find some wonderful frescos around the walls as well. Near the Basilica the ruin of another church the Basilica Battistero in Corte and some Roman era ruins have been preserved. Circa 500AD. Discovered in 1904 during some local excavations. Our evening mellows in a little bar not far from the scooter (luckily enough). Pam tries her first Negroni, likes it so much, she has a second. Only later does Pam discover Negroni is Italian for ‘your going to feel a little dull tomorrow’. Thanks Doriana ! We rise in no particular hurry and decide on a walk along the beach front. It appears that long stretches of the beach front are gated off during summer season and you must pay to enter. As we walk everything is being pulled down. 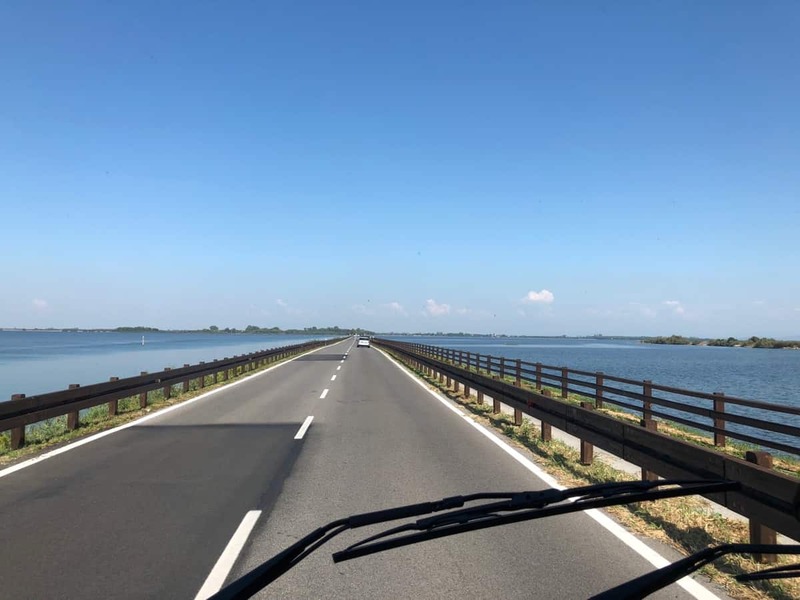 On our return we pack-up and service the Hymer and return across the long causeway that connects Grado with the mainland. 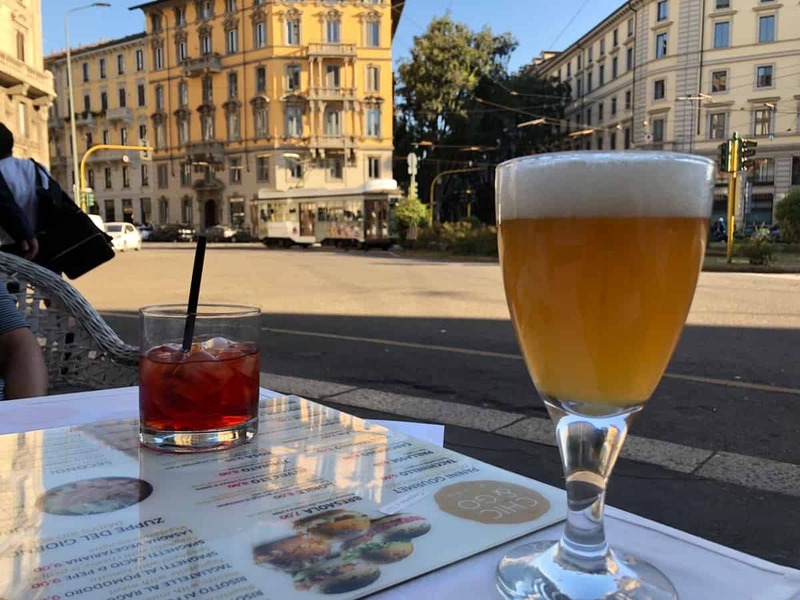 Another beautiful day to add to the wonderful weather we have enjoyed in Italy. 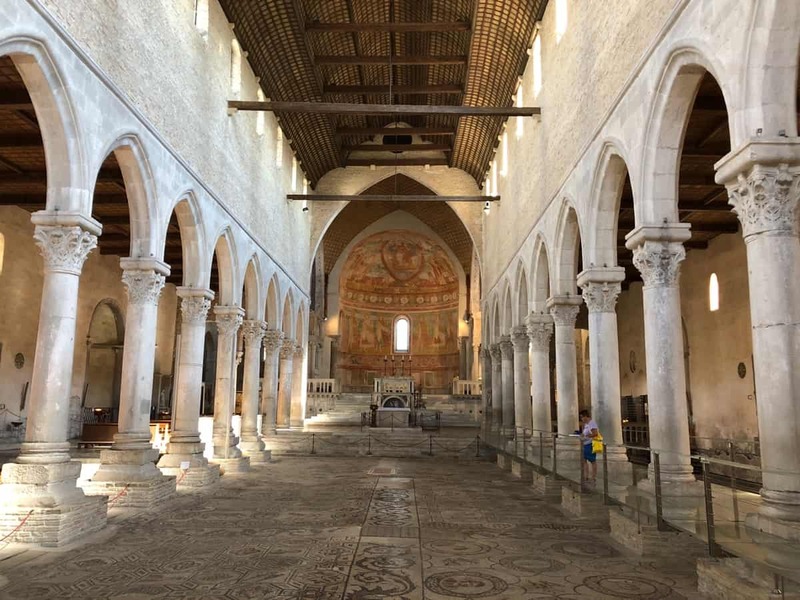 We passed Aquileia on our way to Grado yesterday morning noting lots of ruins and excavation going on. So we thought we would come back for a look. 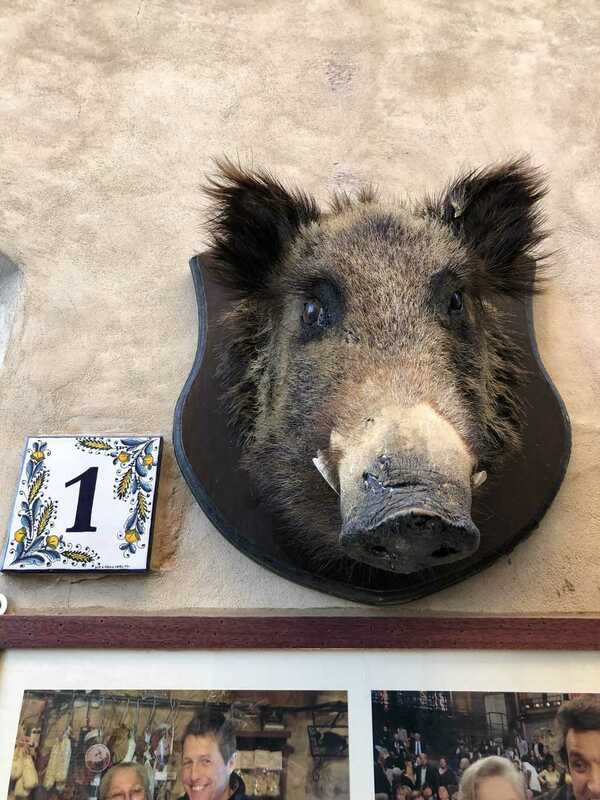 So we stop at the tourist office get a map and go for a wander. 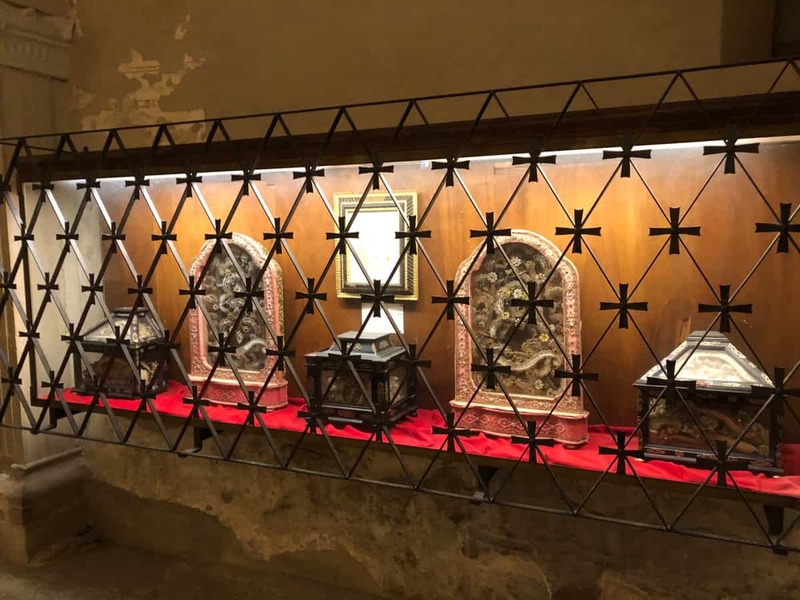 An earthquake in 1348 leveled the original church. 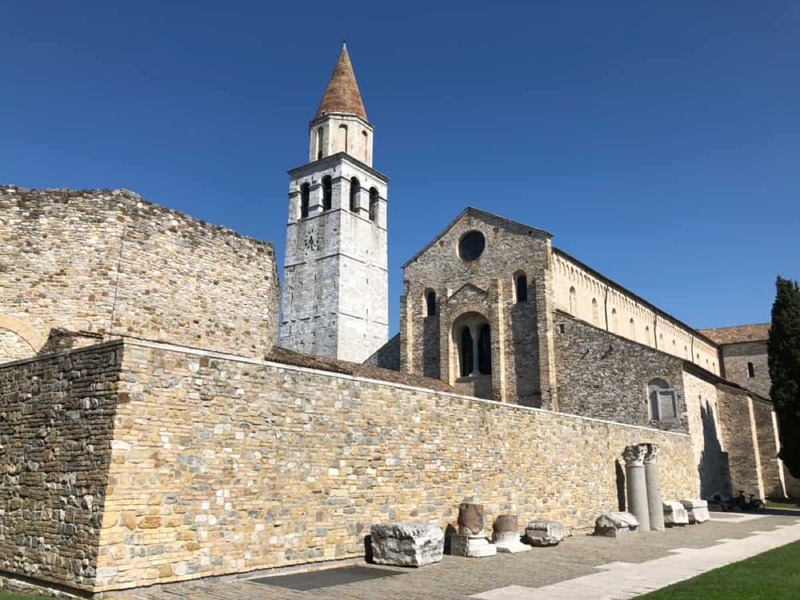 This Basilica contructed on the ruins of the original church. Inside the Basilica the floor has been excavated to reveal the original floor of the Romanesque church that once stood here. 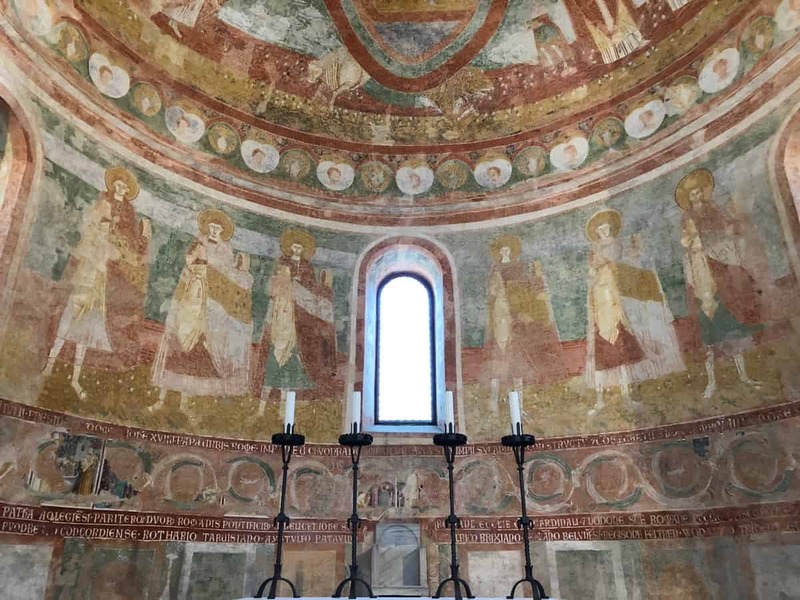 Some amazing frescos fill the altar. 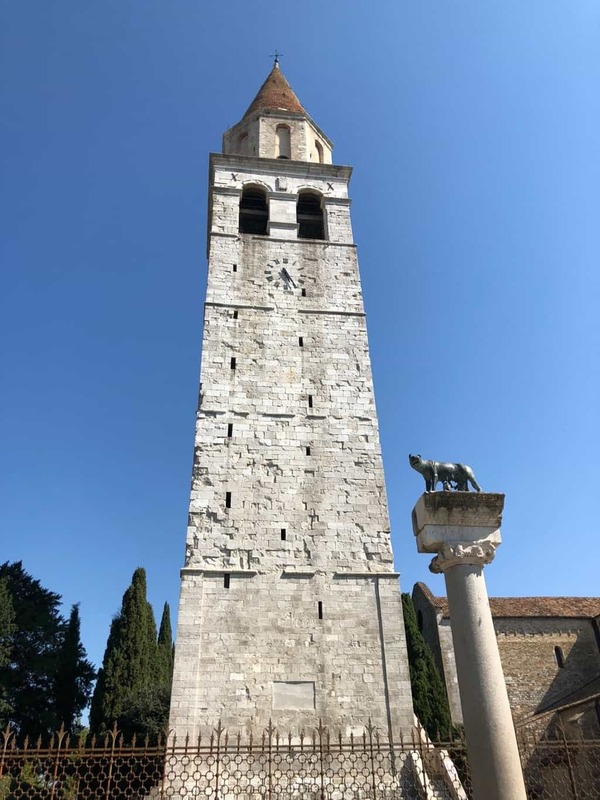 Apparently Aquileia was colonized by the Romans in 181BC at its height it had 100,000 inhabitants. 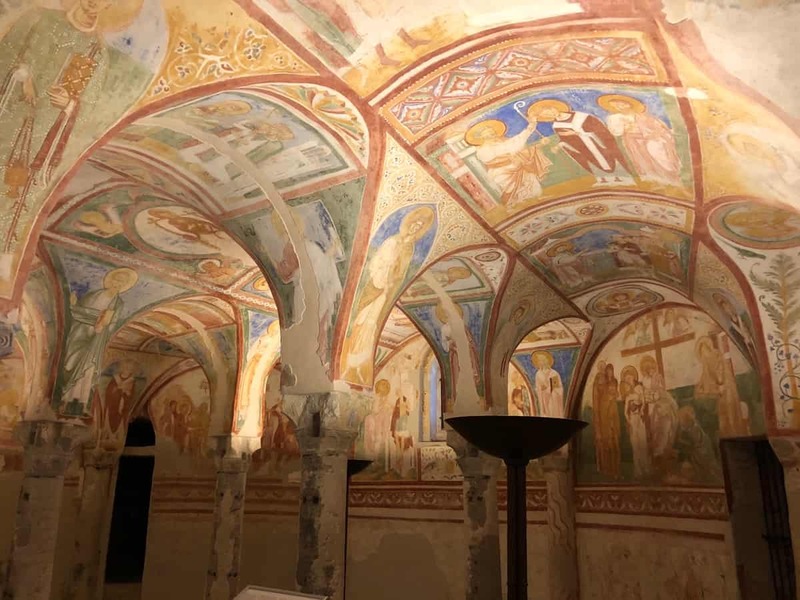 Below the chapel, the original crypt from the old church is also full of frescos. 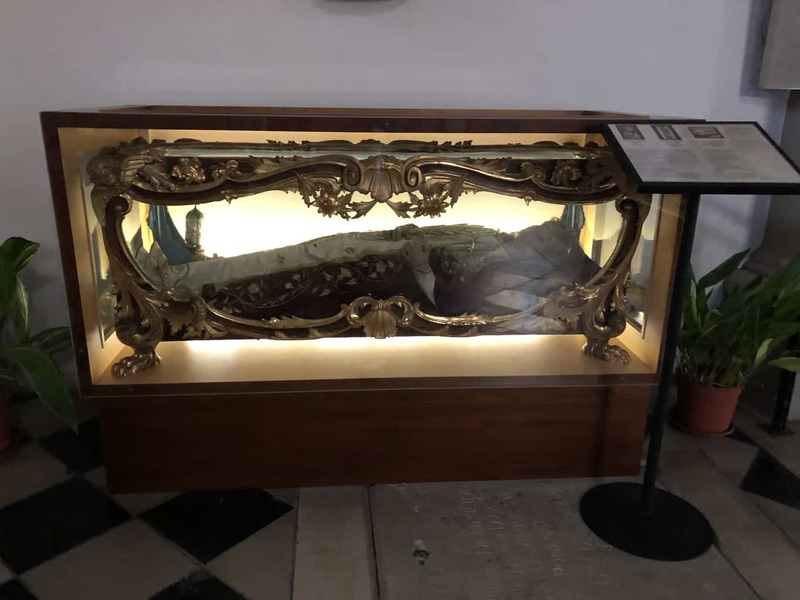 The crypt is also full of boxes of martyr’s relics just to add a bit of glamour. 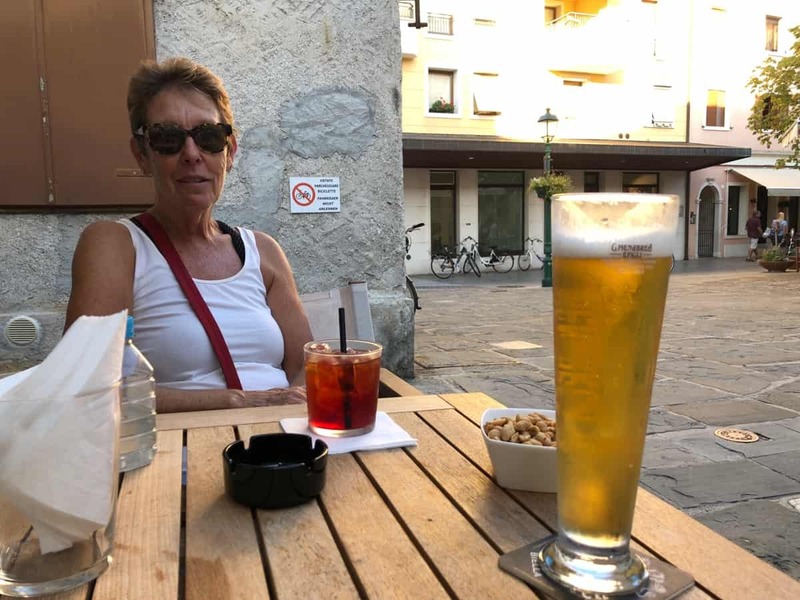 Well that’s it our quick stop in Aquileia. 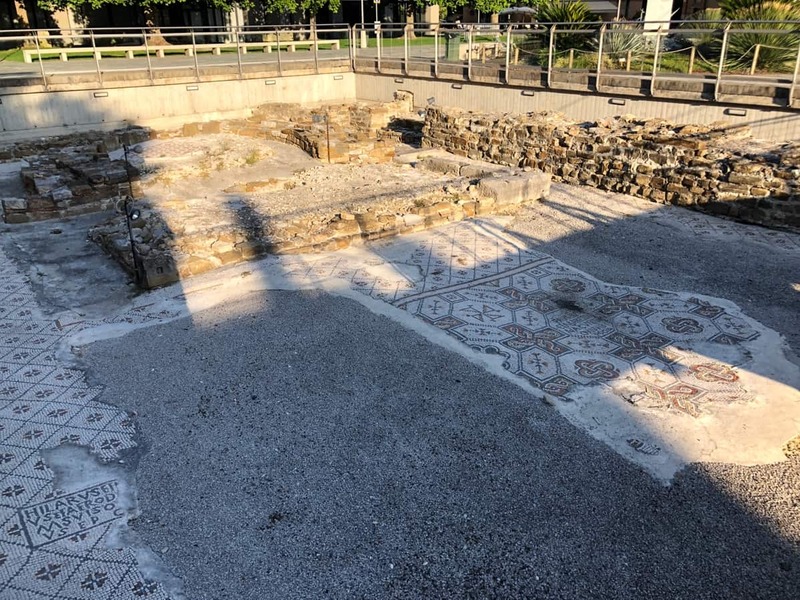 There are three sets Roman ruins currently under excavations around the town, but they each have a separate entrance fee and we have seen a lot of ruins this year. 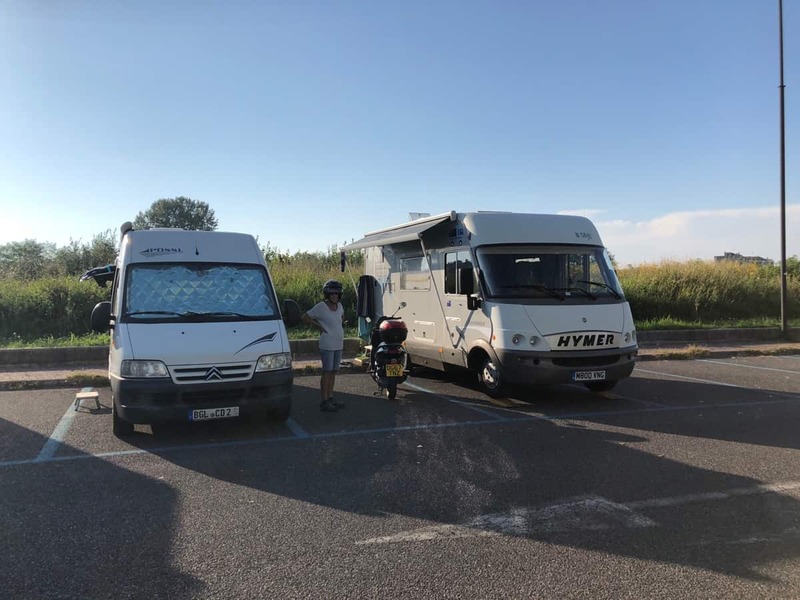 So we point the Hymer north for the Dolomites…. Fabulous Photos and information guys. Is Pam still drinking Negroni ? Previous post Venice (day 2), Italy. 2018. Next post Ampezzo, Italy. 2018.